Earn $73.92 in Rewards credit (7392 points) What's This? 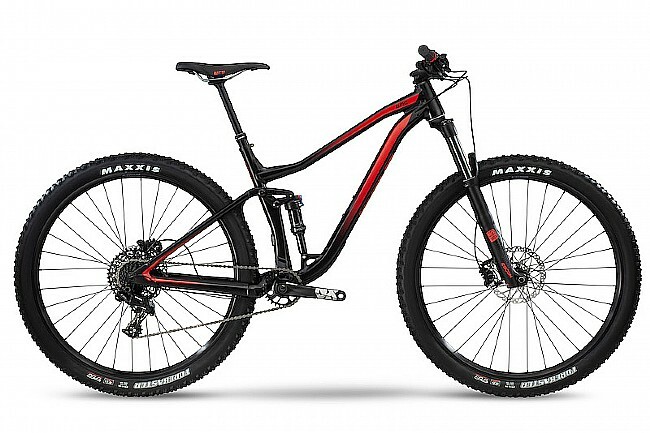 BMC's 2019 Speedfox 03 ONE Mtn Bike is light, sturdy; built for both adventure and speed. The 03 Alloy, Al-13 Triple-butted aluminum frame with its low standover height, delivers maneuverability and stability. Integrated protection and internal routing give it a sharp look that also keeps cables and parts safe during long, hard rides. Frame: Advanced Pivot System, 03 Alloy, Al-13 Triple-butted aluminum (F&R). Fork: Rock Shox Reba SL, 120mm; Tapered steerer 1-1/8” to 1-1/2”, 51mm offset. Rear Shock: Fox Float DPS, Performance, Evol, (120/130mm). Cassette: SRAM PG 1130 11-42T. Handlebar: BMC MRB 03, 760mm. Front Axle: 15x110mm Thru Axle. Rear Axle: 148 mm Boost Rear Axle Spacing. Tires: Maxxis Forekaster EXO, 27,5 or 29x2.35.